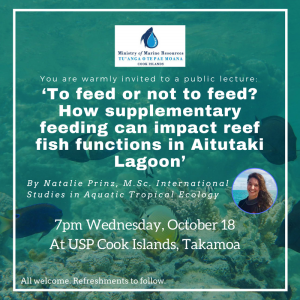 After having the opportunity to present at the Indo-Pacific Fish Conference on the island of Tahiti early in October, thanks to a grant by the CRIOBE, I could expand my stay in the South Pacific to travel another three hours westwards, back to the Cook Islands. The Kellner & Stoll Foundation funded additional expenses to enable a reunion with local stakeholders after the completion of my Masters project. 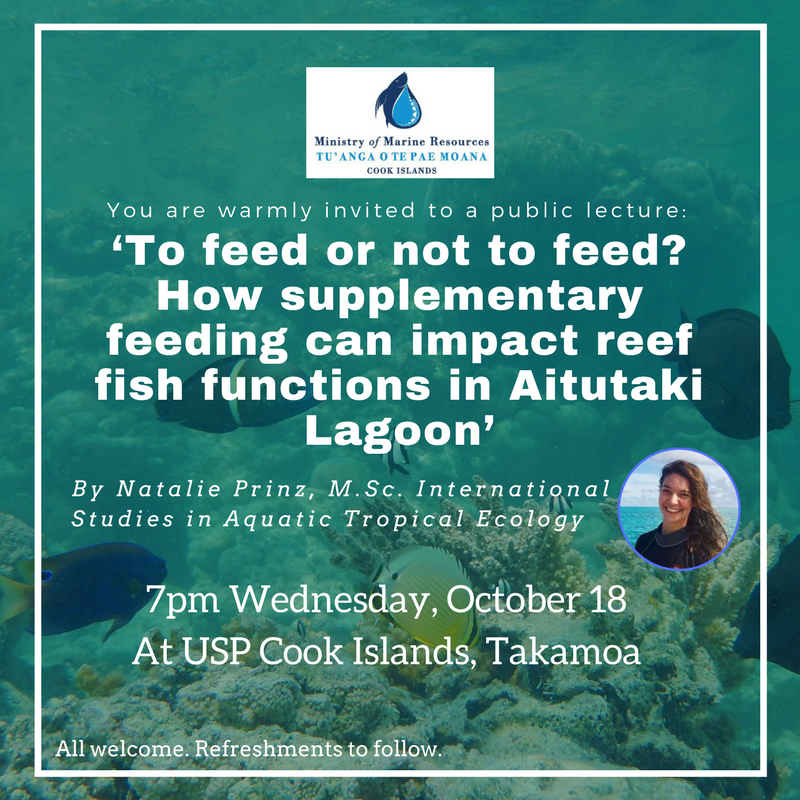 The time between the 12th and 19th of October was well used on Rarotonga, the main island of the Cook Islands, as well as on Aitutaki, the island on which I collected the data for my project. On Aitutaki I could meet my main field support Richard Story at the Aitutaki Marine Station and talk about my findings and the changes that occurred on the island and in the lagoon within the past few months. It is great to see that the Ministry of Marine Resources (MMR) provided the station with a tablet that contains an app for the collection of fisheries catch and lading data. One afternoon I followed Richard to the wharf to meet local fishermen and measure their catch for data collection. 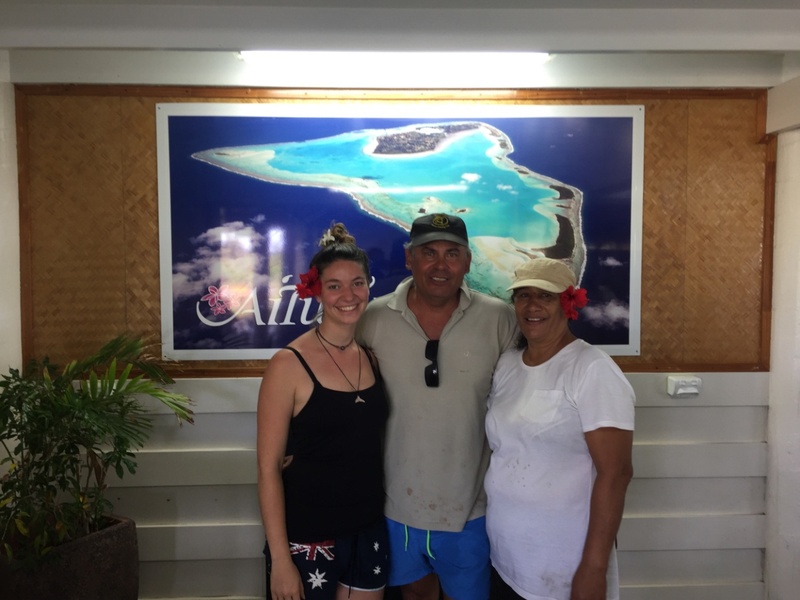 Back on Rarotonga I met my other field support, Stephen Lyon (Pacific Island Conservation Initiative), as well as a representative at the ‘Office of the Prime Minister’ for the returning a copy of my thesis as requested by the research permit. On Wednesday, 18th October in the morning a meeting with the Secretary of Marine Resources, Ben Ponia (MMR) and the Communications Consultant Helen Greig was held. The return was very positively received and communication about the project was very fruitful. 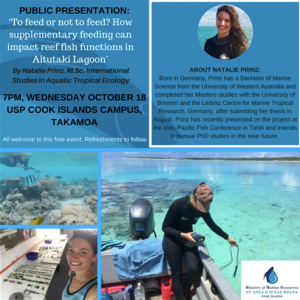 After being advertised in the Cook Island News and on social media, I was honoured to present the findings of the project at the University of the South Pacific in a public talk. The opportunity to return the results to the local stakeholders was of exceptional value to me. On a less personal note: findings will contribute to the development of the Aitutaki Lagoon Management Plan. Meitaki atupaka!